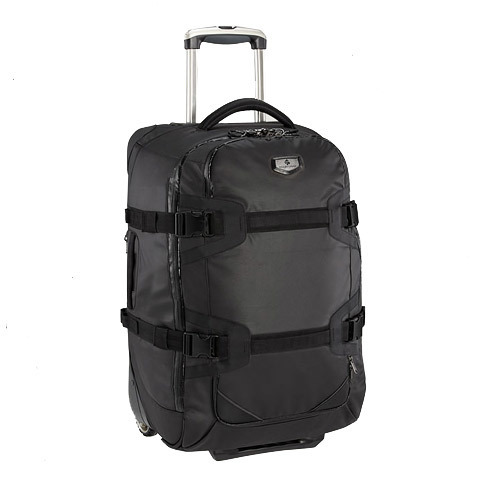 Browse similar Luggage & Bags by Eagle Creek, clearance Eagle Creek Luggage & Bags, or click here for all Rolling Gear Bags. When you are traveling from port to port and have a lot to carry, why make it hard on yourself? Make it easy with the Eagle Creek Flashpoint ORV Trunk 22, a lightweight carry all with plenty of room and mobility. Made of Bi-Tech fabric, the Flashpoint ORV Trunk 22 is extremely weather resistant and durable. Bump it, bash it, kick it---this is a rolling gear bag that will take all you've got. All seams are taped, too, for extra moisture protection. The Flashpoint ORV Trunk 22 packs easily, with an oversized front panel that unzips to reveal a large open space with an optional mesh divider to help you organize your things. It also has an external pocket for keeping wet or dirty clothes separate from the rest. When traveling, you will find it very easy to navigate airport terminals and subway stations with the Flashpoint ORV, which has a rugged wheel and handle system that lets you take all the load off your back. You have also got handles on three sides for lifting the Trunk 22 off the conveyor or overhead rack. Whether you are headed on an international trip or just a weekend getaway, you will love this wheeled wonder travel bag. "Waterproof, lightweight, and durable is what I need for my travels. This Eagle Creek Flashpoint ORV Trunk was the way to go when I went to Mexico for the holidays. This was the only bag I brought and I was so happy with it. The compartments are great, easy to dig through for my clothes. I purchased the black and tag it so it was easy to see. " "This is a must have if you are an avid traveler. I travel overseas mainly with my Eagle Creek ORV Trunk. This thing is durable and tough. It holds all my clothes and shoes and other gear. It has a nice ergo handle that adjusts pretty easy when wheeling this thing around. Excellent organizational compartments inside. Really the perfect size for a jet setter. I don’t leave home without mine. "I commute via train to and from Seattle and Portland, this Flashpoint Trunk meets all my needs. I can use this one bag for EVERYTHING for a weeks plus stay. The black is very low profile. It's waterproof and thats a nice touch for the Pacific NW."